It appears another old school Republican has joined David Stockman in railing against the current ethos of the new breed Republicans, and he brings a lot of interesting points to this analysis. As we've pointed out in many previous pieces the current mantra that 'taxes are too high' for prosperity makes little sense in historical context. Corporate taxes as a % of GDP is at record lows, as multinationals employ entire armies to avoid them, while lobbying for ever more cuts to of course help 'create jobs'. Bruce Bartlett held senior policy roles in the administrations of Ronald Reagan and George H.W. Bush and served on the staffs of Representatives Jack Kemp and Ron Paul. Whether revenue should play any role in deficit reduction is at the root of the fiscal impasse between Congressional Republicans and President Obama. One factor underlying the hard-line Republican position that taxes must not be increased by even $1 is their assertion that the Bush tax cuts played no role in creating our deficit problem. In a previous post, I noted that federal taxes as a share of gross domestic product were at their lowest level in generations. The Congressional Budget Office expects revenue to be just 14.8 percent of G.D.P. this year; the last year it was lower was 1950, when revenue amounted to 14.4 percent of G.D.P. But revenue has been below 15 percent of G.D.P. since 2009, and the last time we had three years in a row when revenue as a share of G.D.P. was that low was 1941 to 1943. Revenue has averaged 18 percent of G.D.P. since 1970 and a little more than that in the postwar era. At a similar stage in previous business cycles, two years past the trough, revenue was considerably higher: 18 percent of G.D.P. in 1977 after the 1973-75 recession; 17.3 percent of G.D.P. in 1984 after the 1981-82 recession, and 17.5 percent of G.D.P. in 1993 after the 1990-91 recession. Revenue was markedly lower, however, at this point after the 2001 recession and was just 16.2 percent of G.D.P. in 2003. The reason, of course, is that taxes were cut in 2001, 2002, 2003, 2004 and 2006. Real G.D.P. growth was 4.1 percent in 1994 despite widespread predictions by opponents of the 1993 tax increase that it would bring on another recession. Real growth averaged 4 percent for the balance of the 1990s. By contrast, real G.D.P. growth in the nonrecession years of the 2000s averaged just 2.7 percent a year — barely above the postwar average. 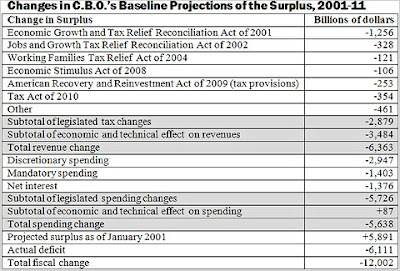 Few people remember that a major justification for the 2001 tax cut was to intentionally slash the budget surplus. President Bush said this repeatedly during the 2000 campaign, and it was reiterated in his February 2001 budget document. In this regard, at least, the Bush-era tax cuts were highly successful. According to a recent C.B.O. report, they reduced revenue by at least $2.9 trillion below what it otherwise would have been between 2001 and 2011. Slower-than-expected growth reduced revenue by another $3.5 trillion. 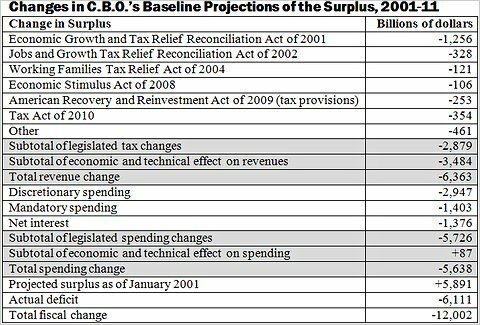 These figures are conservative insofar as revenue is concerned, because the higher interest payments required by the deficits created by the Bush tax cuts are allocated to spending. If one allocates the interest cost proportionally, the Bush tax cuts were responsible for increasing the debt by $3.2 trillion — 27 percent of the fiscal deterioration since 2001. These facts notwithstanding, it has become a Republican talking point that the Bush tax cuts did not, in fact, reduce revenue at all — something the Bush administration itself never asserted. It is hard to know where these totally erroneous ideas come from. Federal revenue fell in 2001 from 2000, again in 2002 from 2001 and again in 2003 from 2002. 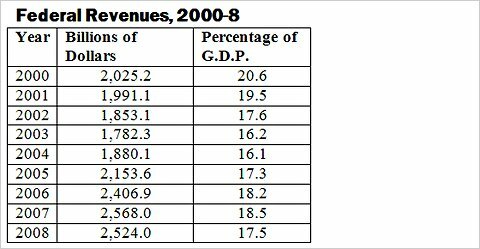 Revenue did not get back to its 2000 level until 2005. More important, revenue as a share of G.D.P. was lower every year of the Bush presidency than it was in 2000. What will happen at the end of next year when the Bush tax cuts expire is already a matter of intense budget negotiations. Perhaps the whole point of the apparent Republican disinformation effort to deny that the Bush tax cuts reduced federal revenue is to make the reverse argument next year — allowing them to expire will not raise revenue.